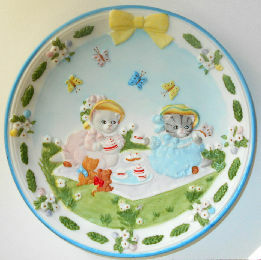 Here is Kitty Cucumber and and a friend enjoying a cup of tea at a picnic. Notice the two little teddy bears that have joined them. This ceramic plate is 7" in diameter. Copyright 1990, B Shakman. Metal loop installed on the back so the plate is ready for hanging. Previously owned but in good condition.